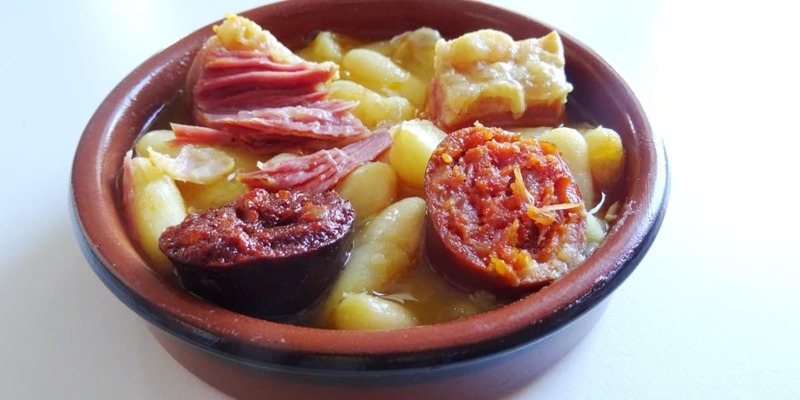 Asturian fabada is one of the most famous Spanish dishes, but as many traditional Spanish recipes, some times it is difficult to find one that is faithful to the tradition. The recipe that I´m bringing to you this week comes from ‘The Wee Honey Bee’, the cook that produces our fantastic home-made foods, and that is Asturian. Sonia declares herself as a ‘fabada fundamentalist’ and challenged me for not cooking properly my fabada at home, and then she provided me with her very own recipe, so I don’t have any excuse for not to cook a proper fabada anymore. Cooking a proper fabada is extremely easy… if you can get the proper ingredients, specially the fabas (Asturian beans). You only need a bit of time and patience. Or, if you are in Edinburgh, you can ask to The Wee Honey Bee to make it for you! Optionally: one onion, garlic and parsley. Prior start cooking, soak your beans in cold water overnight. On a pot pan big enough to take all the ingredients, place the meats (lacon, black pudding and chorizo). Place the beans on top of the meats. Place also the onion, cut into 4 pieces, the chopped garlic, and the parsley. if you are including them on your recipe. Put your pan on the fire, removing the foam when it starts boiling. Optionally, you can also remove the excess of fat. Low the fire, so the stew cooks slow and steady. Leave the pan semi-covered, but don’t leave it unattended. It is important that the stew boils steady, if it’s possible always at the same temperature. Also, be sure that the beans are always covered with water so they don’t lose their skin. From time to time, keep ‘frightening’ the beans by adding more cold water. Optionally, add toasted saffron very well chopped (or powder saffron if you have some) and a laurel leaf. Spanish saffron always comes toasted, but if you use saffron from any other country, you should toast it lightly first. The cooking time depends on the heat of the fire and the quality of the beans. It usually goes from 1h and 45 minutes to 2h and 30 minutes. Optionally: once the beans are cooked, add a chunk of fresh butter and let it boil to melt it. It gives a creamy touch to the beans, and helps to thicken the stock. Alternatively, you can add olive oil at the beginning, along with the rest of ingredients. If you stock is very thin, remove and mash some beans, and add them again to the pan to thicken the stew. This happens when you used to much water, or if the beans were not very good quality. Remove the pan from the heat and let it rest for 30 minutes. Remove and discard the onion, parsley and laurel. Usually fabada is served on a terracotta dish, with the meats cut into bitesize pieces. A bit of beans literacy. In Asturias, there is a romance language called Asturian or Bable. In Asturian, ‘faba‘ means ‘bean’, and ‘fabada‘ refers to the stew made with beans. As you can imagine, beans are the star and main ingredient of this dish. According to The Wee Honey Bee, there are two keys to making a good fabada. One is to cook the beans properly, giving them the time they need, frightening them at least once when they start boiling and removing the foam from the top. The second key is the beans. Finding good beans is important, therefore it’s important to tell the difference between the different kind of Spanish white beans. White kidney beans. They are kidney-shaped and small in size. When soaked in water overnight, the grow a little. They are glossy, and stay firm when cooked. These are the beans that you find in most canned fabadas. Judion de la Granja. They are the proper beans to make a fabada, but there is a problem with them: usually, they have been grown in China, because Asturias is a very small region and it can provide enough beans to cover the whole Spanish demand (let alone to export). They are big and wide, with a white and glossy skin that can sometimes get loose. When dried, they look similar to the British haricot beans, but they grow much bigger when soaked and cooked. Judion de Granja IGP. Those beans have been granted the Protected Geographic Indication, which means that they have been produced in Asturias and meet the quality standards required. They are similar in colour and shape to the white kidney beans, but when soaked and cooked they get much bigger, and they are the best beans to make a fabada. However, they are very hard to find, and much more expensive, but the price differece is worth.